Bitter gourd is a temperate/tropical vegetable offering iron, beta carotene, potassium, and calcium. It also contains high amounts of fiber, phosphorous, and Vitamins C, B1, B2, and B3. The plant thrives in heat and humidity and with the rise of summer temperature, the vines grow faster. 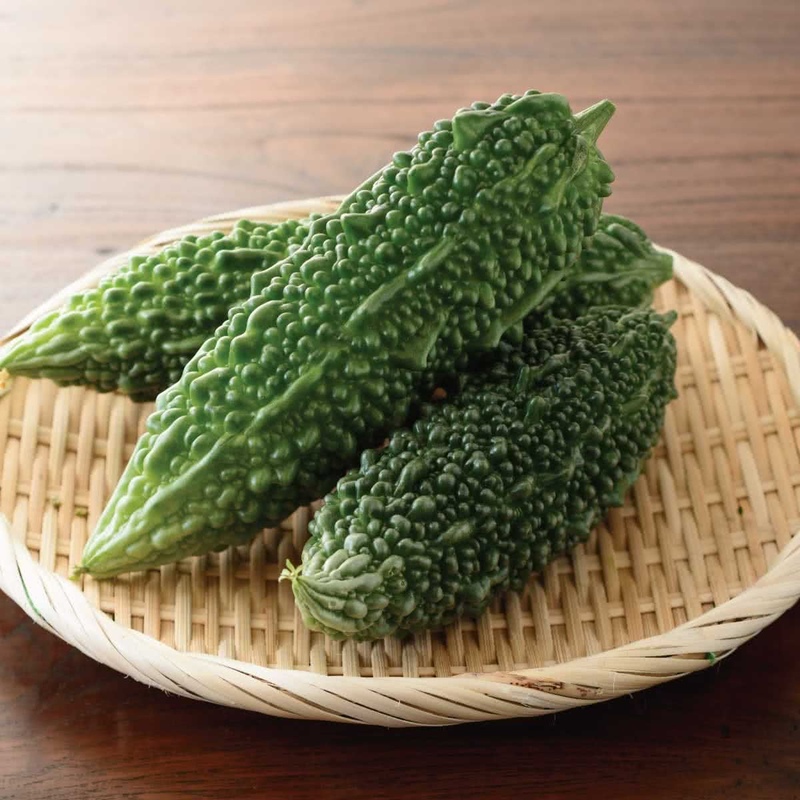 Introduction and Uses: Bitter Gourd also known as Karela / Bitter melon. It is a unique vegetable that can is used for both culinary and medicinal purposes. This oblong shaped vine variety showcases a warty exterior with its size, texture and has a bitter taste. It is rich in minerals and vitamins. The fruit contains anti-diabetic properties, charantin, which might have a blood glucose-lowering effect, vicine and polypeptide-p an insulin-like compound. These features work to help reduce blood sugar levels. It also contains the lectin that reduces blood glucose and is thought to be a major factor behind the hypoglycemic effect that develops after eating bitter melon. Growing medium: 1 part Garden Soil + 1 part Coco Peat + 1 part Vermicompost Or 2 part Garden Soil + 1 part Organic Manure. Spacing: On raised beds, sow two seeds per spot in a spacing of 3 x 3 ft.
Sunlight: Bitter Gourd plants require full sunlight. Therefore your raised bed should be made at a bright sunny spot. Keep the Bitter Gourd container under open sunlight. Watering technique: Water your potted Bitter Gourd plant every day in summer. Water the soil near the plant. Use a watering can to make sure that the plants get water in the form of the shower & not by a single flow. You can also make provision for watering by drip irrigation system for your raised beds. Trellis: Bittergourd is an aggressive climber & needs plenty of space to grow. So develop a strong trellis support up to height of 5-6 ft, by using locally available material like pipes, bamboo, ropes, wires etc. 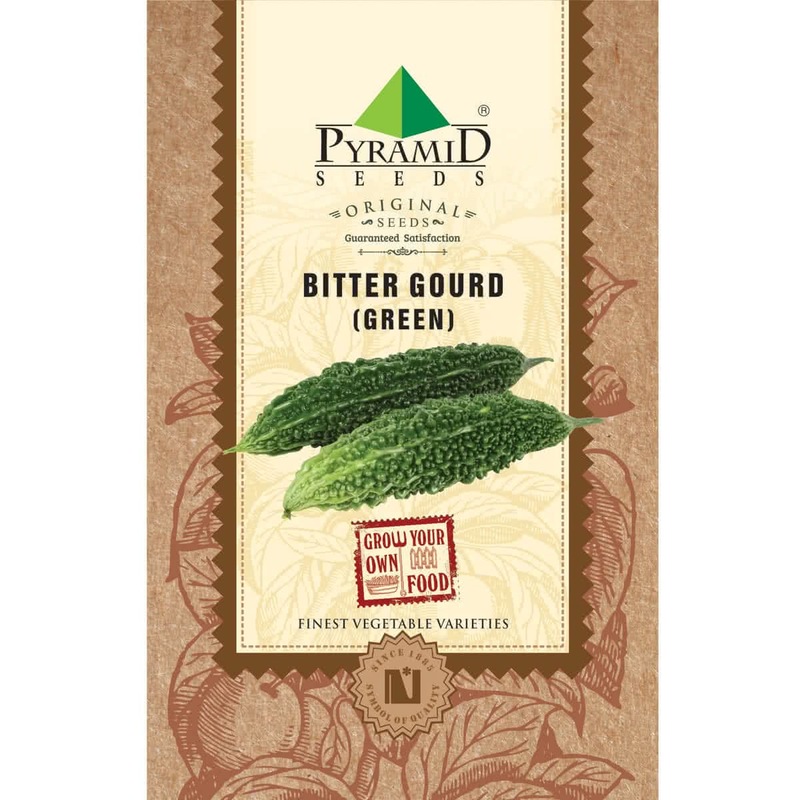 for your bitter gourd plant. Top dressing: When your Bittergourd climber is more than 45 days old, Provide one tablespoon of 15:15:15 (NPK) Fertilizer per plant or mix handful of Vermicompost in the soil around each plant. Note: Bitter Gourds have separate Male & female flowers on same plant. Fruits will be formed on female flower after pollination. Hand pollination of flowers: Take ‘pollens’ from male flowers on painting brush or cotton bud & dust them on ‘stigma’ of female flowers. This will increase overall production of Bitter Gourd. This step is not mandatory. Read about types of insect pests in your garden. Harvesting: (60 days) Bittergourd climber will start flowering at the end of second month. You can start harvesting raw bitter gourd fruits after 2 months of seed sowing. Harvesting season can continue for next 3 months. Approx. 43 to 48 seeds in 8 gm,135 to 150 seeds in 25 gm, 540 to 600 seeds in 100 gm, 1350 to 1500 seeds in 250 gm.